Springfield, MO. 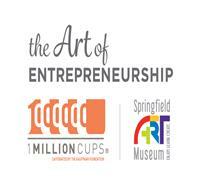 (March 4, 2016) - The Springfield Missouri Organization of 1 Million Cups announced Wednesday its move to the Springfield Art Museum on April 6th 2016. 1 Million Cups Springfield launched February 26, 2014 with the mission to build a start up and entrepreneurial community in Southwest Missouri. This free, weekly experiential event, has hosted thousands of diverse community members gathered to learn from and help build local start-up companies and organizations. There have been over 200 small businesses/organizations that have presented at the event that typically has over 100 community members attend each week. 1 Million Cups Springfield is the third largest 1 Million Cups Community out of nearly 100 national and international communities. The program was created by the Kauffman Foundation in Kansas City, Missouri, based on the notion that entrepreneurs discover solutions and network over a cup of coffee. Each community uses the same format; 2 presenters, 1 hour, lots of free coffee, and asking of the generous question of “What can we as a community do to help your business?" The event began and has met at The eFactory, a tech-focused entrepreneurship center designed to assist startup and growth in new small businesses and continuing education and training in mature organizations. Serving as a front door to entrepreneurship in Springfield, The eFactory helps companies start, grow and accelerate. The eFactory is part of IDEA Commons, a Missouri State University vision and commitment to create an urban innovation park, located downtown Springfield. As the new venue sponsor of 1 Million Cups Springfield, the Springfield Art Museum is dedicated to enhancing the education of and documenting the cultural heritage of the people of southwest Missouri through the collection, preservation and exhibition of art objects. This new collaboration will view Entrepreneurship as an ART. Both organizations seek to expand exposure to each other’s core audience and increase awareness. Join us at the Springfield Art Museum, located at 1111 E. Brookside Drive, at 8:30am for Coffee and Conversation; Presentations start promptly at 9:00am – 10:00am. All are welcome, early stage companies are encouraged to apply to present. For more information on 1MC, please contact Phillip Baird, 417-619-5849 or springfieldmo@1millioncups.com. For more information, please contact Joshua Best, Development and Marketing Coordinator, 417-837-5700 ext. 224 or jbest@springfieldmo.gov.